Sumatran Tiger, Zoo Series, London Zoo 1993. © Britta Jaschinski. Britta Jaschinski’s portraits of animals show an insightful expression of the animal’s identity and individuality, an almost devout fascination with the animal’s spirit. But at the same time they resemble mugshots of trapped and unhappy creatures at their worst moments of suffering, caught and fixed in the harsh frame of the image (which is itself metaphorically another cage). They convey loneliness, alienation, displacement. Paradoxically, a single picture may evoke these disparate sensibilities at the same time, both an homage to the animal’s nobility and an angry protest at his constraints. 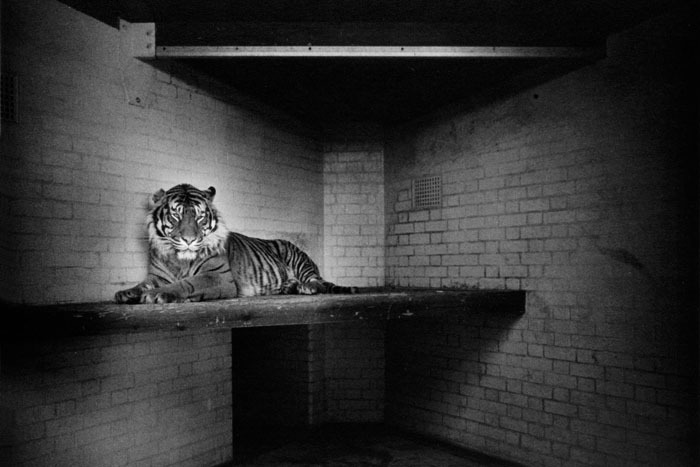 A photograph of a Sumatran tiger (except it isn’t a Sumatran tiger any longer; now it’s a London tiger) reveals pathos, injustice: the pain of an animal in captivity, The tiger is still, silent, stuck. A pervasive human geometry defines the space. If spectators can infer any sense of emotion or sentience from the creature depicted in a room of sterile white tile, it is resignation, defeat, anomie. People have a propensity for gawking at subjugated otherness — for example in freak-shows or on reality television — as a way of reaffirming our own supremacy. In the nineteenth century Londoners used to go to Bedlam (St. Mary Bethlehem Hospital) to stare at the lunatics. For a penny one could peer into their cells and laugh at their antics, generally sexual or violent. Entry was free on the first Tuesday of the month. Visitors were permitted to bring long sticks to poke the inmates. In the year 1814, there were 96,000 such visits. Hi Tim, there was a hiatus with the captions for the series, but they are properly dated now. The pictures were taken in the early 90s. Best, David.